Lidar stands for "light detection and ranging" and is a radar-related ("radiowave detection and ranging") method to remotely measure atmospheric parameters. Lidar systems send out laser pulses and detect the backscattered radiation. From the signals' time delay and the speed of light, the distance from the backscatter location can be determined. Clouds and dust particles in air (so-called aerosols) scatter laser radiation very strongly. Therefore, a simple application of lidar is the highly resolved detection and distance determination of clouds and aerosol layers. Depending on the wavelength of the laser light used, lidar systems are more or less sensible to molecular or particle backscattering. Backscattering from molecules is called Rayleigh scattering and shows a 1/λ4 proportionality. 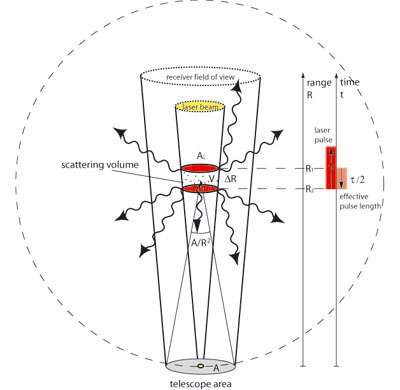 The magnitude of particle backscattering at a certain wavelength depends on particle size, refractive index and concentration of the scatterers. With lidar systems that emit multiple wavelengths, the size distribution of atmospheric particles can be determined (inversion). A variety of atmospheric parameters can be measured with different lidar techniques: temperature, pressure, moisture (water-vapor concentration), concentration of atmospheric gases (e.g., ozone, sulfur dioxide, methane etc.). Additionally, the optical properties of cloud particles and aerosols can be determined (extinction coefficient, backscatter coefficient, depolarization) and ice and water clouds can be distinguished. The time of interaction τW is negligible. With a typical laser pulse length of a Q-switched Nd:YAG laser τL = 10 ns and a time constant of the detection electronics τN of 50 to 200 ns, a range resolution ΔR of 7.5 to 30 m is achieved. The received power P(R,λ) depends on 4 terms which are listed and explained in the following table. Given that P0 is the average power of a single laser pulse and τ the temporal pulse length, the pulse energy is derived by E0 = P0τ. ΔR = (cτ)/2 is the effective pulse length. A is the area of the primary reception optics and η the overall system efficiency (optical transmission from emitter to receiver and detection efficiency). The geometry factor contains the overlap function of the laser beam with the receiver field of view, called O(R), and a R-2 dependence. The latter is obtained from the fact, that the area of reception is part of a sphere's surface with radius R, centered in the scattering volume. The backscatter coefficient is an atmospheric parameter which determines the strength of the lidar signal. It describes how much light is scattered in the backward direction. Molecular scattering (index "mol") ist primarily dependent on air density and decreases with increasing height. The influence by particles (Index "aer") is highly variable in space and time. As already mentioned, β and α depend on the wavelength of the laser light. This relation is determined by the size, refraction index, and shape of the scattering particles. Wandinger, U. (2005), Introduction to lidar, in Lidar - Range-resolved optical remote sensing of the atmosphere, C. Weitkamp (Ed. ), Springer, New York.